It’s a dark, dark day. I scrimped, I saved and I ignored my student loan to save all my pennies for my baby Canon back in 2007. 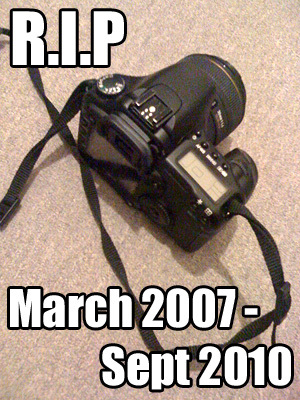 And on Saturday it went to the great big Crumpler in the sky. I’m moping. The skies are grey and the birds aren’t singing. My shoulders are struggling to support the weight of my big fat, miserable head and Winter feels closer now than it ever has before. I could catch beach balls on the shelf that my bottom lip has become and I’ve discovered the wonder of the monosyllable. And yanowot really pisses me off? These bloody cameras cost MORE now than they did 4 years ago! *kicks something* (not a small child incase you had your phonebook open at Social Services). Um… So uh, how was your weekend? Don’t tell me it was ggggggreat, ‘cos I don’t give a flying fstop. So sad to see your camera is broken! I got a second hand Canon DSLR on eBay the other day, maybe worth checking out a second hand one instead of a brand new very expensive one? oh no! what happened? Your amazing pictures were nearly one of the best parts of the blog! I’d love to know how you do it. I got a pretty good deal on a camera in Argos recently, don’t worry, you’ll soon be pointing and clicking again! Hey Charlotte there are lots of point and shoot cams now that take really great pictures, you just have to pick the right one. they’d cost less and at least they’ll hold up till you save enough for a new DSLR. Im sorry to hear that What happened? What happened to it? Have you taken it to a camera store, they may be able to save it. And there are so many digital SLR available nowadays maybe try looking into a different brand (I love my Pentax one) for a cheaper alternative? Best of luck! *hugs* I love your blog! aww no! I’m sure it has gone on to a better place..
Aww, sorry to hear that! What happened? Is it not fixable for sure? I’m so sorry about your camera! That happened to me about a year ago too. Time to start saving again! Oh noes! I’d be crying if my Canon died on me too. I hope the money fairies bring you a new one soon. You could get the 7D if you’re interested in pro full frames, or the 550D … it has Live View and the ability to take beautiful films with SLR lenses! Cheer up (sorry if I’m being horribly unsentimental) – time for faster SD or CF cards, better quality, more focal points et cetera! It’s the shutter Costs nearly as much to repair as the camera would second hand anyway. Gonna get a 50D, they’ve dropped in price because of the newly announced 60D. Don’t really love the feel of the XXXD range… too lightweight and small. Would die for a 7D, but funds won’t stretch that far! Yes, will have to upgrade my CF cards… my old 2GB won’t cut it anymore! Eeek… I was hoping it wasn’t the shutter. Yes, don’t get the XXXD … it’s not a good investment as more people are upgrading beyond the prosumer line. It’s difficult to resell since it’s not top of the line and its prospective customers are more concerned about new perks. Even if you intend to work it till it dies, it’s not as resilient as the XXD or XD. Aaahh!!! I’m so sorry, honey! That’s really, really awful. Oh no! I’m so sorry to hear that, it’s awful! *after a minutes silence* I feel your loss…I don’t want to sound like an old lady but, things don’t last like they used to do they! In four years I’ve got through 2 cameras, 3 TV’s and 2 hoovers! When I was a kid we had the same TV for about 10 years! Hope you can find a new even better amazingly cheap camera soon! oh no! i’m sorry, i’ll terribly (and already do) miss all of your photos…. ahhh please get one sooonnnn!!!!!!!! lots of love! and camera wishes your way! Oh I know how you feel ! What exactly happened to your camera? ?